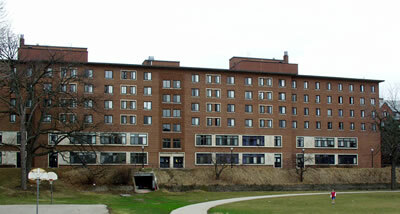 Alice Crocker Lloyd Hall is a 176,000 gross-square-footage residence hall housing approximately 560 students. The renovation will update infrastructure, including: new plumbing, heating, cooling, ventilation, fire detection and suppression systems, wired and wireless high-speed network access, renovated bath facilities and accessibility improvements. New spaces will be created in the vacated dining areas that are no longer needed since the Hill Dining Center became operational. New and reorganized spaces within the facility will revitalize the old residence hall and create much needed spaces for living-learning and academically- related activities, dance practice and multipurpose space, art studio, music practice rooms and spaces for student interaction and community development.